French audio is, I feel, far too little known outside France, with perhaps a few notable exceptions. This is a shame, as I believe we are missing out more than we should. Particular as they often are, the French also have their own notions about sound; just like Italians, they too have a proud musical heritage, and some of their companies show it well. One such company surely must be Mr Jacques Mahul's Focal-JMlab. Active for just short of two decades, it has for years been a prime source of drivers to many a well known speaker manufacturer, especially in Britain (along with the equally famous French competitor, Son Audax). 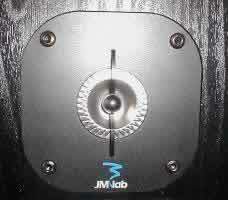 As things stand, if you want drivers and kits, you need Focal; if you want complete speakers, you need JMlab. Either way, it's Mr Mahul. Tantal is JMlab's least expensive line. As expected, these speakers are finished in vinyl, and only the smallest member of the family is available in mandatory black - others offer a choice of black ash, palisander and light oak, or their vinyl counterparts. To be frank, the finish is rather good, better in fact than I expected for the meager sum asked for it. It's a very straightforward 2 way bass reflex enclosure, which instead of the usual circular reflex tube uses a rectangular port on the front baffle. This is in my view a preferred arrangement to back firing ports; while it doesn't eliminate problems with back walls and placement, it does help in reducing their importance by a reasonable factor. The driver complement is quite common. The bass/mid driver is a cellulose treated 120mm cone, while the tweeter, surprisingly for this price, is a 25mm titanium unit. Even more surprisingly, the dome is inverted. News to me, old stuff to JMlab, which uses this arrangement in each and every model in all their lines. In the absence of literature, I'm not quite sure what JMlab claims about this. However, I was impressed by the fact that the dome appears to be made in a single step process, including the diamond-shaped surround (strongly reminiscent of JBL - pardonnez-moi, les gars!). I was even more impressed by the rear mounted pair of binding posts - never before have I seen such massive gold plated posts on a speaker in this price class. Yes, there's only one pair, so no biwiring, no biamping, but hey, look at the price! Anyway, JMlab states its response is "65-22.000 Hz +/-3dB", its sensitivity is quoted at 89dB/1W/1m, its impedance is rated at 8 ohms with a minimum of 4 ohms (kudos to JMlab for quoting the minimum as well! ), the crossover point is given as 3.5 kHz, and maximum programme power rating at 70W. Recommended amplifiers are given as 10-60W. Dimensions (HxWxD) are given as 300x175x200mm, and it weighs in at an even 4 kilos. The front grille is built around a plastic frame and is detachable - but I wouldn't do it (see later on). The last good touch is that the binding posts will accept cables up to 5mm thickness - I had no problems whatsoever with my standard 4.5 mm OFC cables. Lo and behold, finally a manufacturer emerges who does not damn you to telephone line caliber cable just beacuse you're buying their cheapest speaker! All you other dummies, make a note of this. Adjust the volume to just above whisper level and be ready for a surprise. No, it won't dwarf Martin-Logans and Revels of this world, but it will sound out on a par with all other competitors in its price class I ever heard. And with a little tolerance, if we allow its class to be expanded somewhat, that would include the likes of Tannoy Mercury 2, and even B&W DM302. It's all there, from the top down to the bottom. In case of the top, the 505 is the one to beat - it's extended, but really extended, no sheen, no false brilliance, just some sweet sounds. Sure, I heard better, but that better also cost better, and in some cases, much better. The bass is lean, but it's mean. From such a small box, with an estimated effective volume of some 5-6 litres, and a 120mm driver, what do you expect? Godzilla will fail to impress you with its weight here, but what is important is this - it may not go deep, but what it has, it does honestly. The low end is clean and with little hangover, giving the box an air of speed and immediacy. First and foremost, this speaker does not appreciably change its character more than usual when playing loud. To a certain extent, of course, it does change character in absolute terms, as every speaker does. However, in subjective terms, it changes its tone rather significantly - as every small box does. Playing loud subjectively accents the lack of deep down bass lines, which just aren't there to carry the music along. This makes loud playing small speakers subjectively seem more unbalanced towards the upper octaves than they really are. I'll get back to this in a short while. Another thing I noticed is the subjective lack of compression until really loud, something I get much more often than I'd like in the upper octaves. I have no idea if that's what the inverted dome is about, but if it is, I can report that it's working pretty well. In absolute terms, you'll be listening to far louder music than is comfortable long before you stress the speaker - but do take the manufacturer's specifications very seriously. On the down side, the upper range will sound a touch more prominent than it should be. Or so I feel. Overall, this is a very much up-and-at-'em speaker. It wastes no time in going about its business and projects a feeling of great certainty that it knows exactly what it's doing. This is not to say it's too serious a speaker - no, in fact, it's a very lively and full of life speaker. It doesn't just play music, it lives the music. In that sense, it's almost like a relative, a distant cousin of JBL, but in other aspects, it's out there by itself. Not surprisingly, given the price, it lives the music more like a raw, natural talent, rather than an educated musician. It goes about music making in a very honest way, no tricks, no stunts. It just does its job and seems to enjoy doing it, and generally has a lot of fun. It projects music along an imaginary line approximately aligned with their own front grilles. Obviously, it also has its failings. The lack of bass lines is the most obvious one, but there are other less obvious ones. I usually like to take the front grilles off so as to have maximum dispersion - do that on this speaker and you will indeed get a little too much treble. This I take to be a design trade-off, one can't have it both ways - either the grille stays on and you have what you need to have, or you take it off and have more treble than you need. The other alternative would have been to get it right without the grille, but then, once you put the grille back on, you'd have a depressed treble. In my view, given its price and targeted segment of the market, I think the designers made the right compromise - but note that this is a very subjective matter. The unknown factor here is the environment it will find itself in. If a room is heavily furnished, more upper range will be absorbed, hence more compensation will be required. As it happens, my room is only reasonably furnished, and this gave me a feeling of still a little too prominent upper ranges. Not too much, but enough to be noticable. The dispersion left to right is good, even very good given the price, but the front to back projection is definitely not one of its strong points. Subjectively, you have all performers lined up next to each other in the same line - you can tell where each is, but within the same line. This is not too much of a problem with modern music, but is not good for complex classic works, one tends to loose perspectives. Despite the front baffle reflex ports, I discovered that these boxes are very sensitive to placement. Moving them even a little, like 6-10 cm, can sometimes produce notable differences in the sound obtained. Of course, all speakers react to placement, but not many do to this extent. If you place them on shelves, as they are intended to be placed (the other, much more preferable choice being on stands), make sure they are angled, or you may be facing some thudding pseudo-bass. Other than this, you can just sit back and have some honest-to-goodness fun with these boxes. It's not really Hi-Fi, but the fun factor is high. They are indeed small in volume, weight and price, but they have a big heart, and it's in the right place. I don't know how you did it at this price, but well done, gentlemen! But do make them a little less bright, would you? Not true Hi-Fi, but fun to listen to and can be a boon as special effects speakers. Very good as cheap back speakers. I was somewhat enchanted by these speakers, despite their bright character and lack of serious bass, so I experimented a lot with them. I used different electronics and found them to be very tolerant of what they are being driven by in electrical terms - obviously, not so in acoustic terms, but that's hardly news. 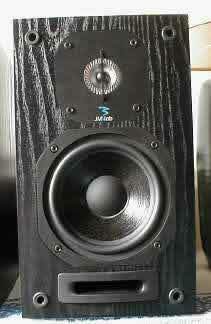 I connected them to my JBL Sub10 active subwoofer, supplying a 26cm (10") driver powered by its own internal 100W amp. It took me a better part of a day to get them to cooperate, but after much twiddling and playing around with the sub's controls, I got it right - crossover from sub to 505 at around 100 Hz, sensitivity of the sub at 10 o'clock, phase positive. And sure enough, it was a whole new ball game - now the 505 was augmented by some powerful bass lines, which added, well, good red wine to a tasty rye sandwich (with cheese and ham). It was now a whole meal a man could live on, even if still a little on the bright side. Curiously (or perhaps not? ), adding deep, powerful bass lines just put the excellent tweeter in better perspective. I put on Hevia's "No Man's Land" and just let it go. It sounded good. I went on to Vangelis, and he sounded good too. Next, I threw on some Edit Piaf, and she sounded really good. By the tenth CD, I gave up. But I stayed impressed by the speed of these speakers. Next, I placed them on top of my JBL Ti600 speakers, wired them to the same source, but turned them backwards, so they were firing at the back wall. This produced some interesting results, so I experimented some more. Finally, I settled on arching the 505 at approximately 45 degrees left and right on top of their respective boxes - now, that produced some really interesting results. There's a 2dB difference in efficiency (JBL's 91dB vs 505's 89dB) and this seemed to have something to do with it all. Finally, I hooked up another amp and drove it via tape outputs of the first, so the first powered the JBLs and the second the 505s. This hookup allowed me to adjust the volume for each pair at will, and this produced some DAMN interesting results! It would seem that in uses such as this, their slightly bright character comes in very handy. At some point, the back wall sort of moved back some 10-12 meters, and my cherished third dimension - depth - was there. Oh boy, did I have fun. Now, this led me to think that these boxes might just be ideal for, you know, the THING we're not supposed to talk about here, the curse of audio technology, all this gag about, well, pictures and sound, that stuff, yeah, home you-know-what. No, you work it out, I have an editor and you don't. So, you could and should augment these little wonders with a subwoofer, now or later. Logic dictates using the same source for the sub, but you're by no means obliged. Another idea you can explore is adding them to your present system as, well, augmenting multiple rear firing radiators (I'll have to patent that one!). Put them on your present floorstanding enclosures, hook them up and give them a go. Try as many possibilities as you can think of, you may just find the right one. The variables here are speaker sensitivity and power amps. You want your main speakers to be more efficient than these little boxes, else you risk having too much reflected sound. Also, if your present boxes go below 6 ohms, the amp may not like seeing the total load impedance (now consisting of paralleled speaker A plus speaker B impedances) go below 3 ohms, and in practice, it may well go below 2 ohms, God alone knows with what phase shifts. You may experience some current limiting from lesser electronics, which unfortunately includes some not-so-cheap components (but if you have a Krell, don't worry, be happy). Yet, this will become a serious problem only if you push the amp; as long as you're within usual room volumes, it shouldn't be problem. Biamping is of course possible, but I don't think it makes much sense in terms of prices involved. Judging by this model, listening to JMlab's bigger, better and more expensive speakers may well turn out to be great fun - I hope so. My thanks to the Korato of Belgrade for the loan of the speakers.